I'm a recent convert to Hungry Jack's. Now don't get me wrong, I'm no obese fast food junkie, it's just that every now and then, short of time, stuck in the middle of the city or on a long drive, I'd always defer to a McDonald's meal. But after sampling some of Hungry Jack's Penny Pincher menu options, I felt some of the barriers between Hungry Jacks and my good self were breaking down. So on a lovely sunny day on a long drive at 1.30 pm, I was feeling pretty peckish. Having been seduced by their Stunner Deal advertising blitz and with a Hungry Jack's store conveniently on the horizon, I pulled on in. 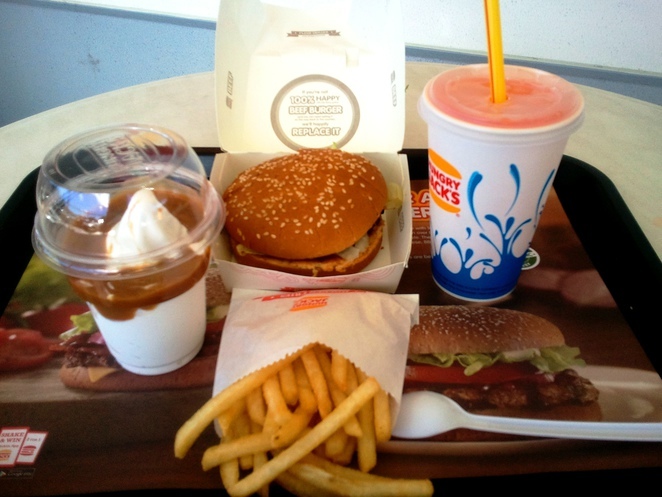 For only $4.95, I had the choice of a junior whopper, chicken burger or cheese burger for a first course, a small chips for a second course, a mini sundae dessert and a small fizzy drink. I chose the junior whopper which sells for $3.55 on its own. So this does seem like a stunner deal. Did this Stunner Deal blow my mind? 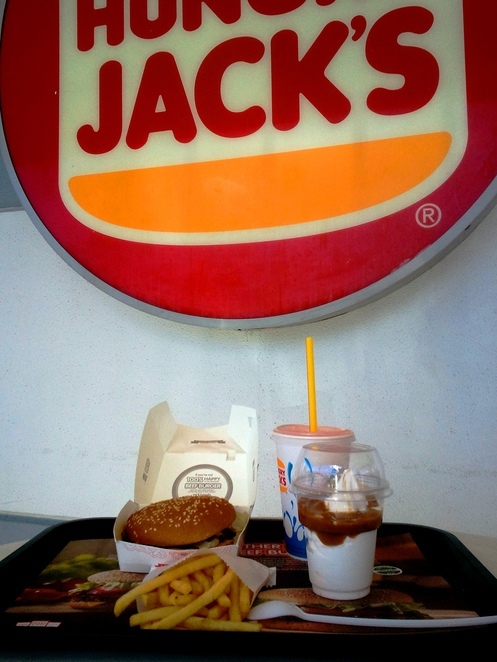 Well, Hungry Jack's is not fine dinning but for my $4.95, my three course meal including a drink certainly satisfied my taste buds, cured my hunger pangs and didn't blow the budget. Three course meal? This is a joke! I've long thought what a great deal this is - especially when i've been hungry and broke! My experience with the Launceston store was a very negative one. First we had to wait half an hour, with other customers walking out in disgust. If the staff were doctors the patient would be dead and buried before they did anything. It was evident the staff did not care as they were slow and were happy to do everything except serve the customers or prepare food. Speaking of which the order was wrong, burnt, incomplete and unpresentable. We had to throw it out as it was inedible and the little bit we did have made us sick, making us wonder if this was deliberate because of comments on how slow they were. I will never go to this establishment again, as the staff do not care about the customer, and I will be telling everyone I can to avoid the store at all costs if Hungry Jacks cannot lift their game and provide food that is not going to poison it's customers, if they cannot serve in a timely manner. If the staff do not care then quit and give someone who does care the job. Get rid of the staff at Launceston because they are running the business into the ground.